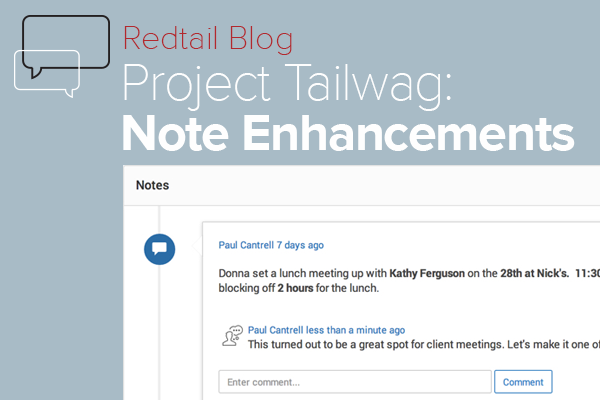 Today we continue our Sneak Peek Series on Project Tailwag with a look at enhancements we've made to Notes in Redtail CRM. While we didn't make use of all of those in the example above, what we did use made the same content much easier to digest. For lengthier Notes, that becomes even more important. Now, let's take a look at the highlighted area from the Note above. We've added the ability to comment upon Notes within Project Tailwag. The highlighted area above was not a part of the original note, but rather a comment added eight days after the original Note entry. We incorporated this largely because we've seen frequent requests for the ability to edit Notes. While we couldn't make that change for compliance reasons, by introducing the ability to comment upon Notes we've given Redtail users a way to accomplish those edits without altering the original Note in any way.